Many of the big child developmental theorists (Montessori, Dewey, Erikson) preach the importance of giving young children opportunities to participate in real and important work each day. Completing appropriate tasks successfully improves a child’s sense of self-worth and communicates to them that they are significant and capable. A great way for parents to do this is include children in their daily care routines. Diaper changes are frequent and young children see changes as an important part of their day. As young as 15 months, children can begin to help prepare and clean up after a diaper change. Place around 10-15 diapers in your basket (different sizes for different aged children can be placed in two rows if possible). Add a package of wipes that children can open themselves. If you have two different sized diapers, teach your children how to distinguish between different sizes (Joey’s diapers have Mickey Mouse on them, Andrea’s diapers have Pooh Bear). Pick up a box of parchment paper that has separated squares (usually marked for deli sandwiches). If you choose to buy a roll, you can cut the pieces up at home yourself (make each 18″-24″ long). Costco sells a large box of 500 pieces that will last you for a year. Choose a location on the ground to store your diaper changing station in a room that is regularly used by the children. I like to store mine tucked under a large chair or entertainment center. Be sure it is easily accessible to the children and is near a flat area that is comfortable to lay on during diaper changes. 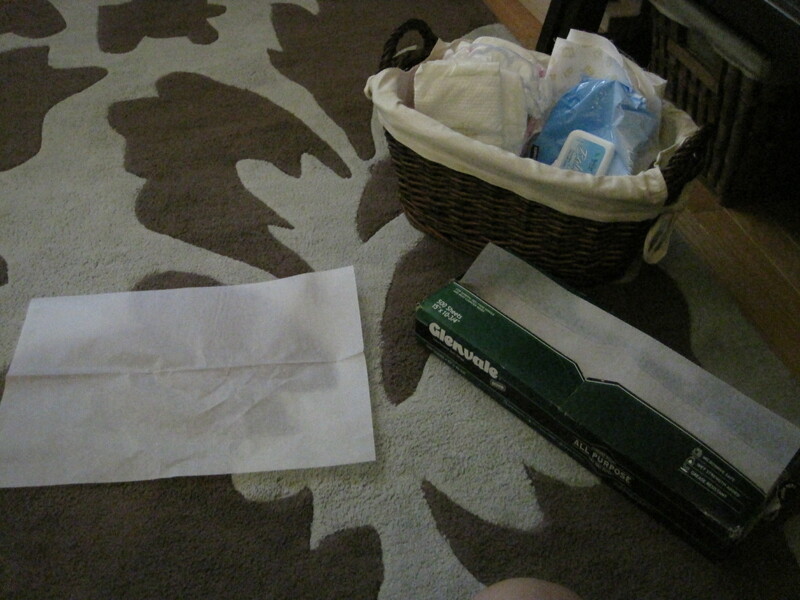 You can place parchment paper pieces in a ziploc bag inside the basket, or keep the box of parchment pieces next to the diaper changing basket. When your child needs a diaper change, ask them to go take out 1 piece of parchment paper, 1 diaper and as many wipes as you think are necessary. If the child cannot count yet, you can ask them to simply take the package of wipes out and place them next to the diapers. Tell the child to find you when they are done. Congratulate them on their hard work and enjoy a quick and easy diaper change. Place the child’s behind on the parchment paper, change the diaper, slide the parchment paper out from under the child’s now clean behind and place the dirty diaper on the parchment paper. Put a clean diaper on the child and then wrap the parchment paper around the dirty diaper. The parchment paper is commerically used to wrap sandwhiches which can be juicy, just like a diaper, and can hold even the messiest of messes. Sometimes it may take a couple of pieces of parchment when a child’s behind is very dirty, but it is much better than having diaper mess touch your floor or carpet. 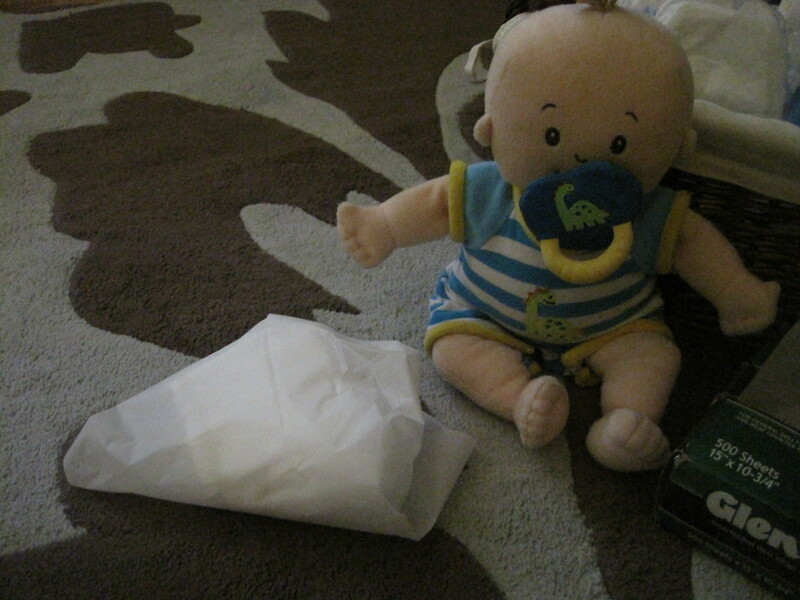 Hand the parchment wrapped diaper to the child and ask them to dispose in your chosen location. Mess free and easy! 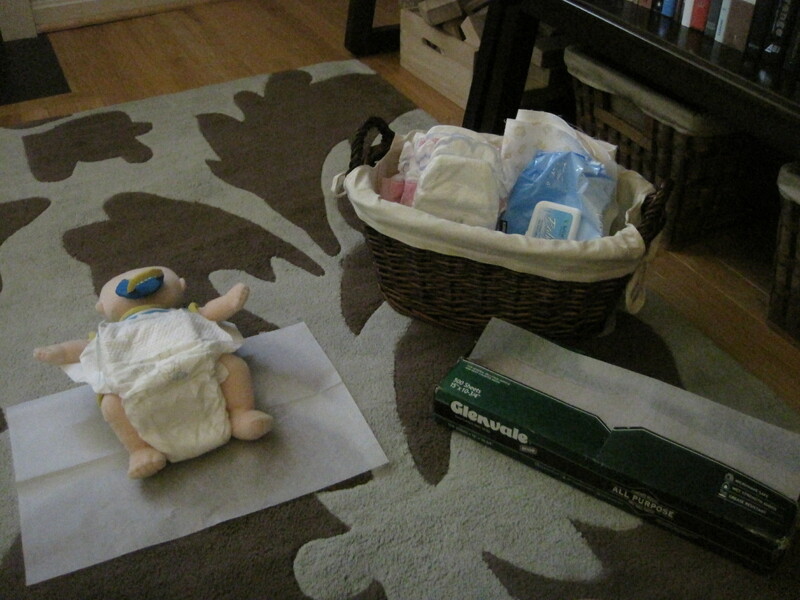 Parchment paper is also ideal for newborn diapers, as they can be especially sticky. Take advantage of quick wrap and roll diaper changes without the mess prior to your child being at an age where they can help.